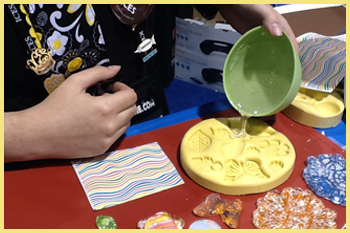 *Silicone molds can tolerate the high heat of the melted sugar. Plastic molds will melt. 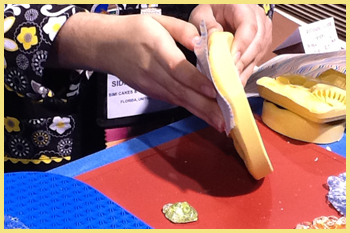 The flexibility of silicone also helps the sugar piece to pop out of the mold easily. 1. 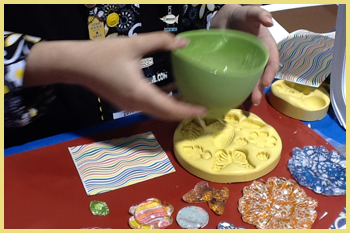 Place the pre-cooked Isomalt into the silicone bowl and melt in the microwave until liquid. Heat at 30 second intervals, stir and reheat until completely melted. 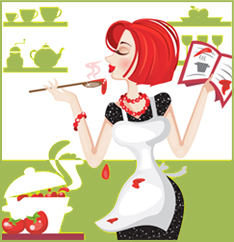 (Don’t heat for longer intervals as the center of the sugar will be hotter and if it burns, you will have to discard it). 2. When you take the Isomalt out of the microwave, swirl the bowl in your hand to distribute the heat and help the air bubbles rise to the surface. 3. Pour the Isomalt into the silicone mold. Be careful! It’s hot enough to give you a nasty burn. 4. Cut a piece of printed icing sheet large enough to fit over the butterfly. Peel off the protective plastic backing. 5. Place the cut icing sheet with the design face down over the poured sugar and press down into the mold with your fingers to make it stick all around the mold. 6. Allow the sugar to cool for 5 minutes before unmolding. Thicker molds will require longer cooling times. 7. 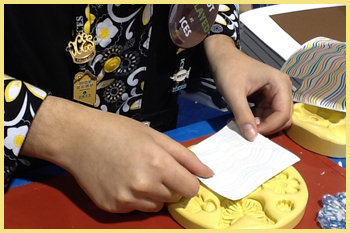 Turn the mold over into the palm of your hand and flex the mold to release the sugar piece in your hand. 8. 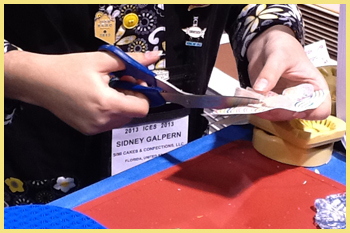 Use the scissors to trim off the excess icing sheet all around the shape of the butterfly. 9. The surface of the butterfly will be cloudy from the accumulation of air bubbles. Torching it will shine it up. 10. 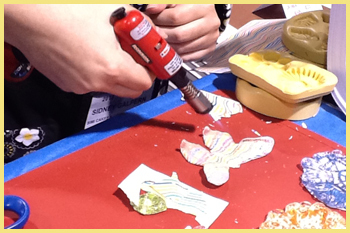 Turn the torch on and quickly move back and forth across the surface of the butterfly sugar piece but do not hold it in any one spot or the sugar will lose the definition created by the mold. Note that a small flame should come from the torch – not some long blaring flame that will ruin your sugar piece. Be sure to adjust the torch accordingly before you start using it on the sugar. 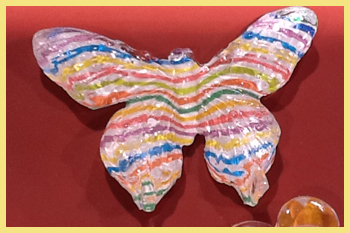 Now the Isomalt butterfly is ready to use any way you want. If you would like to put it on the side of a cake, you can turn the butterfly over, dab some of the liquid Isomalt on the back of the butterfly and hold the butterfly in place for about 30 seconds until the sugar sets. Theresa Happe is a cake decorator and owner of Cake-decorating-corner.com and CakesWeBake.com. You can follow her on Google+. very interesting article. I tweeted this article.